The emerald expanse of Sunken Garden, where students sunbathe and study; the manicured lawn of the Alumni House, where alumni reconnect and newlyweds take their first steps together; the welcoming green of the Wren Yard, where visitors are awed by William & Mary’s history and new students ceremoniously become a part of it: They are all the responsibility of Ernest “Vinnie” Russell. 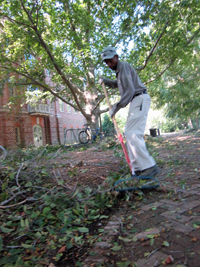 For 34 years now, Russell has worked tirelessly to keep the grounds of William & Mary beautiful. He is responsible for the maintenance of some of the most high-profile spaces on campus, yet he has kept a relatively low profile, going about his daily tasks with a quiet determination as the W&M community enjoys the lush, green landscape that he helped create. On May 5, Russell will be recognized for his work when he receives the 2014 Charles and Virginia Duke Award. Established in 1997, the award is presented annually to a staff member for his or her outstanding service and dedication to the university. Award winners are recognized at the W&M Commencement ceremony and receive $5,000. Russell, a husband and father who currently lives in Toano, grew up in Charles City. He started working at a young age and was interested in becoming a manager at the country store where he was employed when it went out of business. Two of his uncles worked at William & Mary, and they suggested he join them. In 1980, right after high school, Russell did just that, accepting a job with the university’s grounds department. Although he didn’t know much about the field at the time, he was determined to pick up all that he could from his uncles, supervisors and other coworkers. Russell’s proactive approach to work earned him a promotion to lead worker in 1993. Since then, he has led the turf crew that cares for the grounds of W&M’s historic campus, including the Wren Building and Sunken Garden. Although he takes pride in all of his work, Russell especially enjoys working near the Wren Building and the Alumni House. “I just love them because I know Wren is the number one spot, and the Alumni House has a lot of weddings on the weekend, so I like to keep it looking the best I can,” he said. Throughout his career at William & Mary, Russell has held himself and those he works with to a high standard. He especially appreciates when parents and students tell him how beautiful the campus is. “It makes me feel some kind of good, like someone gave me cash money,” he said. In addition to his regular work, Russell has often been called upon to help the campus during times of need. He has helped with litter pick-up during holiday weekends, and he has plowed snow, spread sand on icy pathways and helped clear storm debris from campus. Paul Morie, Russell’s supervisor, said that Russell is often “leading the way” during special event or inclement weather situations. “His intimate knowledge of the campus and its procedures are an invaluable asset I know I can rely on when needed,” Morie said in a nomination letter. Russell said he never expected to win the Duke Award and couldn’t believe it when President Taylor Reveley called him. “Mr. Russell’s cheerful demeanor, constant hard work and willingness to pitch in and help no matter what the task exemplify the best that is William & Mary,” said McFarlane in a nomination letter.